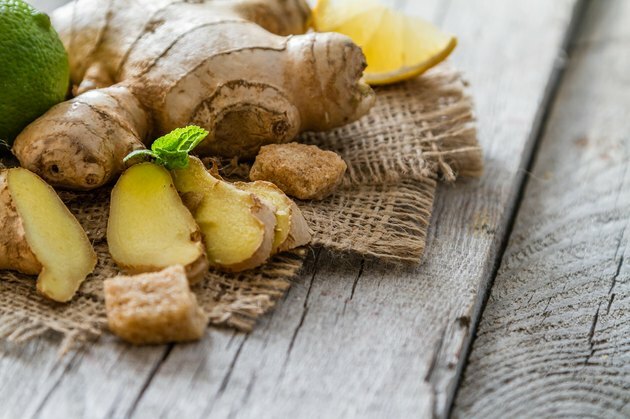 Ginger is a root herb that can be used for medicinal purposes. Ginger can be used to treat nausea, states the National Institutes of Health. Since nausea is a common symptom of acid reflux, consumption of ginger may help treat acid reflux. Ginger is available to be purchased raw in root form, supplement form or made into candies. The root form can be used to make ginger tea. Ginger tea is made with water and ginger root. Lemon and honey can be added for flavor. Ginger tea is not a cure for acid reflux. Please consult your physician. Pour water into saucepan and bring to a boil. Meanwhile, peel ginger with vegetable peeler and slice into thin pieces. Thin pieces allow for more surface area of the ginger root to be exposed. Add ginger root slices to boiling water. Turn heat down, and simmer for about eight minutes. Use the colander to strain ginger pieces from the tea. Ginger pieces can remain in the water but the flavor will be intensified. Allow the ginger tea to cool for one to two minutes, or until it has reached desired temperature. Lemon and honey may be added for extra flavor. You can drink ginger tea at any point in the day, especially when experiencing acid reflux symptoms. Always speak with your physician before adding supplements to your diet. Ginger can interfere with certain medications. How Do I Make Ginger Tea With Ground Ginger?